He ended the first day shouldering arms to a Doug Bracewell ball that crashed into his stumps, but was reprieved for a front-foot no-ball that didn’t exist. He started the second day leg before wicket to Southee, but for a faint edge before ball hit pad. All through that second day he looked uncomfortable. He scuttled around the crease. He poked and prodded at the ball. He defended with application, but when he scored it looked accidental. Yet by the end of the day he had a Test batting average higher than Don Bradman. You read that correctly. 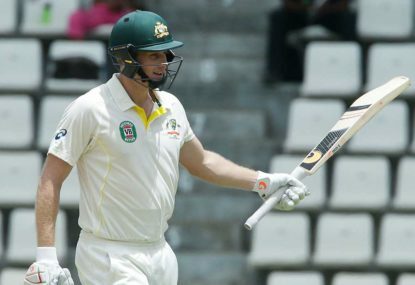 As of the end of play on Saturday (February 13), Adam Voges was not out on 176, taking his average of 100.33 past Bradman’s 99.94 late in the day. The only player ahead of them is the great anomaly Andy Ganteaume, who made 112 in his only Test innings in 1948. » Can Adam Voges better The Don’s average? There was vague and humorous mention made before this match that Voges could pass Bradman with an innings of 172 not out. It’s just that nobody was really expecting him to do it. Anomalies resolve themselves, and early peaks come down. And of course, it doesn’t mean a great deal. No one is claiming that the short career of Voges really rivals that of Bradman. Nor does a hundred average mean anything specifically: it’s higher than 90 and lower than 110. But cricket is obsessed with the century, arbitrary as it might be. We refer to it as the demarcation of an innings of substance. It is proximity to that hundred that defines Bradman: the outlier beyond all outliers, in any sport or any era, the player whose record is nearly twice as good as the next best to play the game. Given all of that, there is a sanctity to Bradman’s number. The sight of a mere mortal approaching it, even for a moment, gives a sacrilegious thrill. It is true that you can look at Voges’ record with a sniff. No doubt he would rather be more like Bradman in having made runs against England than in terms of statistical trivia. You can note the bulk of his runs being made against West Indies and New Zealand. Averaging 542 against the Caribbean side can become a joke that diminishes the batsman. But Voges’ achievements are nonetheless impressive. He has played three bad Tests, put under Ashes pressure at the start of his career, before getting his game back on track in the last two matches of that series with two fifties. Two of his five centuries have been scored overseas, in less than ideal conditions and with his team in trouble when he came to the crease. Many a good batsman has left New Zealand or even the modern West Indies with numbers dented and reputation diminished. His last three innings have been unbeaten hundreds, a run of 551 runs spanning more than a thousand match minutes: the longest undefeated streak in history. Seven other Australians have made three in a row. What made this latest hundred, and such a big one, so unlikely, was the way Voges looked in making it. In the sixth over, he was hit by a Trent Boult bouncer that he didn’t even try to evade. Or play. Nor did it look like he’d chosen to wear it. He froze, unsure what to do and hit by default. The next over, Boult’s swing had him beaten on the inside edge. In the ninth of the day he was nearly run out on a poor single. For long periods, he was either tied down or volunteered to knot the ropes himself. His singles were made with the bat twisting in his hands, uncontrolled skews either side of the wicket. In the 14th over, he smashed Mark Craig, the offspinner, for two boundaries, then produced a confident cut to Tim Southee. But the moment proved to be a glimpse of sun from behind fast-moving cloud. If he wasn’t facing maidens, he was facing five dots before taking a single. Usman Khawaja cruised past a hundred, Voges shuffled to 100 balls for 34 runs. Then he edged Southee through gully but it wasn’t claimed. His fifty came up after lunch from a boundary via the outside edge. In the 75th over of the innings, he blocked out five Corey Anderson balls before driving a fine boundary through cover, but the rest came by patience, waiting for the odd ball down leg that could be glanced or the wide that could be cut. And yet, and yet. There was an inevitability about his batting. Khawaja looked destined to make runs, and did, with a brilliant 140 laced with gorgeous left-handed cover drives. Voges looked destined to remain not out, due to the sheer application he was applying to each ball. His batting looked so bad that it couldn’t possibly fail. He eye was in, as far as defence was concerned. Testing deliveries were kept out, others were left alone. It’s just that when he scored that he looked less like a batsman than a bunch of cushions cobbled together with tape. He entered the 90s via a slash edged over gully. Craig donated him two pies for the hundred, but on 114, Voges edged a cut shot over McCullum at slip. He was scoring quickly now, his third fifty coming up in 44 balls. He just wasn’t scoring convincingly. On 134, his pull shot was top-edged for four. On 162, over slip again, with a bit more intention but still plenty of risk. All the while, his career average was creeping higher, each dozen runs on the field taking it up by another run or so in the record books. Whether he knew or not is anyone’s guess. But he remained cautious, blocking and watching, equal to a glorious Anderson yorker that would have felled many others. None of this description is to disparage Voges. He did right by his team at the time. This is his gift: the knowledge that Test cricket prosperity requires patience and discipline. It needs the ability to ignore a partner who is filling a highlight reel each over, an ability to focus purely on the ball, your own game, and the task at hand. Voges does not always play this way. His 269 not out against the West Indies was scored at a glorious strike rate of 94.38. Of scores of that magnitude or bigger, only Virender Sehwag has scored them faster. That day everything Voges struck was perfect from the moment he arrived. His work in limited-overs cricket can be similar: clean, composed, irresistible. That’s the thing: He can do that when the circumstances permit, or demand. In other situations, he can graft the ugliest damn 176 not out you’ve ever seen, but you don’t get any more runs for batting pretty. In Wellington, Voges was like a beaten-up old car, rusty and bumpy and cramped, shaking your bones along with a rattle in the engine, a cloud of muck from the exhaust, and a weird smell something like burning a stockpile of cassette tapes, but one that nonetheless will chug on and on and on with an engine that will never stop turning over. If he’s a run-machine, he’s an old and battered one. For that reliability, a cheeky Bradman-besting average is his reward. And sure, it can all change the next morning. He might be out and drop down, and history shows the near inevitability that he’ll continue on that trajectory. This heady peak will be just that – a peak. But as any mountaineer knows, there’s not a whole lot left to do once you’ve made it up there but enjoy the view for a moment and head back down. The thing is, Voges knows how to look terrible and produce terrifically. Think about it: when he left a ball that crashed into his off stump, he wasn’t out. There is something symbolic in that. Geoff Lemon is a writer, editor and broadcaster covering sport for The Roar, The Guardian and ABC, as well as writing on politics, literature and history for a range of outlets.